Amy Hempel’s “In the Cemetery Where Al Jolson is Buried” uses gallows humor to enforce the tragedy of the situation the narrator and her friend are in. 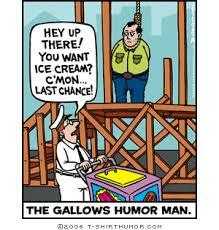 Gallows humor is always about very unpleasant or serious circumstances, such as death, war, disease, or crime. In this story, the characters use it to deal with the reality inevitable death of the former college roommate. For example, the Good Doctor’s joke about epileptics is very dark, but the character is portrayed in a positive light. The roommate is clearly afraid of dying and wants the narrator to distract her from her fears. The narrator knows this and does not try to talk her out of her fears because she feels her friend has a right to be afraid.